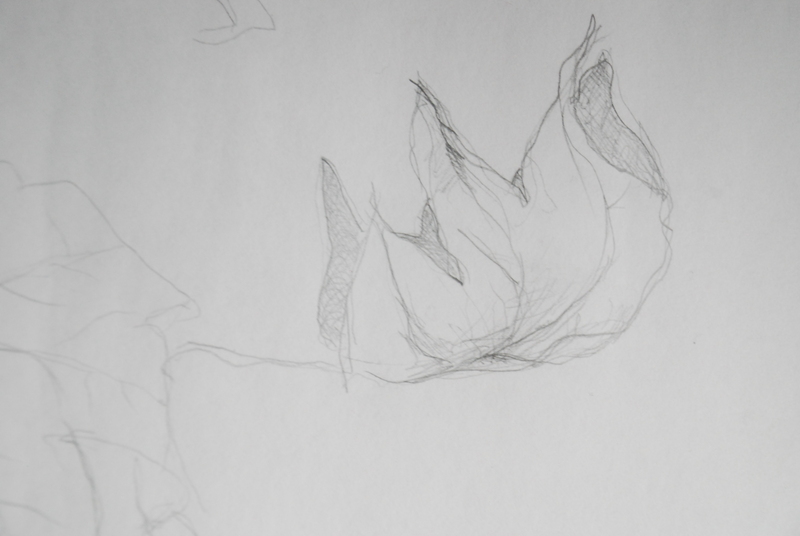 We were then told to start drawing these objects in a way to bring them alive, give them a character, emotion, and to make you relate to the object, and almost forget the fact that it is in fact a object, not a person. 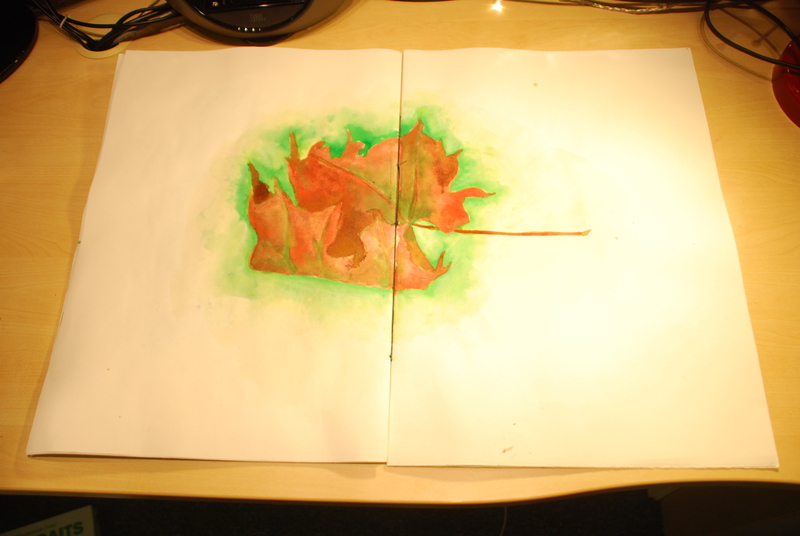 We were also to use minimal colours, and to try to keep it to only two colours. 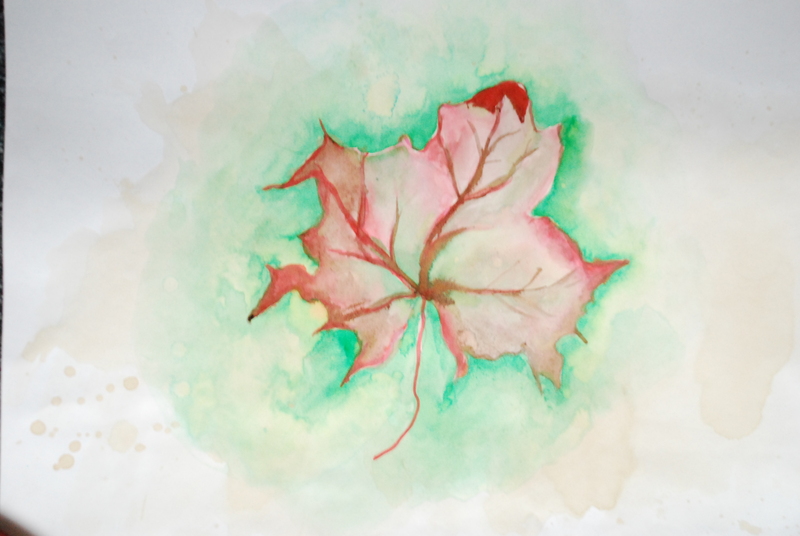 I began by collecting random objects, such as objects from the coffee shop, and dried leaves and twigs from outside. We had to read a few different poems, of which we decided on one to illustrate. I started by researching into the meanings of my chosen poem, and I split the poem down into sections and decided how best to illustrate the story so it came across almost telling a story. I chose Dulce Et Decorum Est (1), as I felt the theme in the story was so sad and emotional, and that it was a story that I really wanted to tell, all about men in the trenches who are very tired and warn out, been to hell and back when all of a sudden there is a attack of thick green gas, and the men are all stumbling about and fumbling trying to put their protective wear on, but one is so tired, that he fails, and the onlooker witnesses him dyeing a painful death, and they threw him into the back of a wagon where he spent his last seconds. 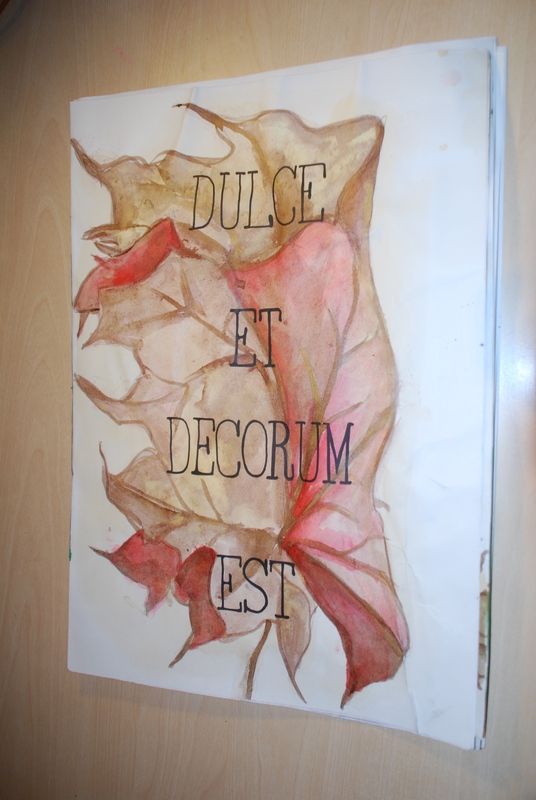 I was very touched by the poem, and as I was deciding between different materials to personify, I decided upon leaves, as I felt they would naturally be manipulated, to show they’re posture, or composition to show emotion, as well as which, all leaves have different colouring, but all are quite similar to military colours. 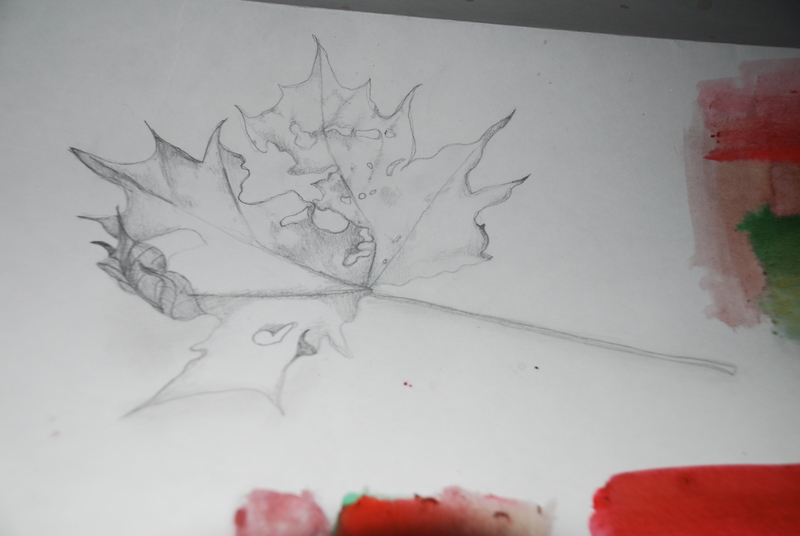 Another reason leaves were ideal, were because dying leaves have change colour and show death in a remarkable way, which I thought manipulated would show a brilliant symbolic meaning to the story. 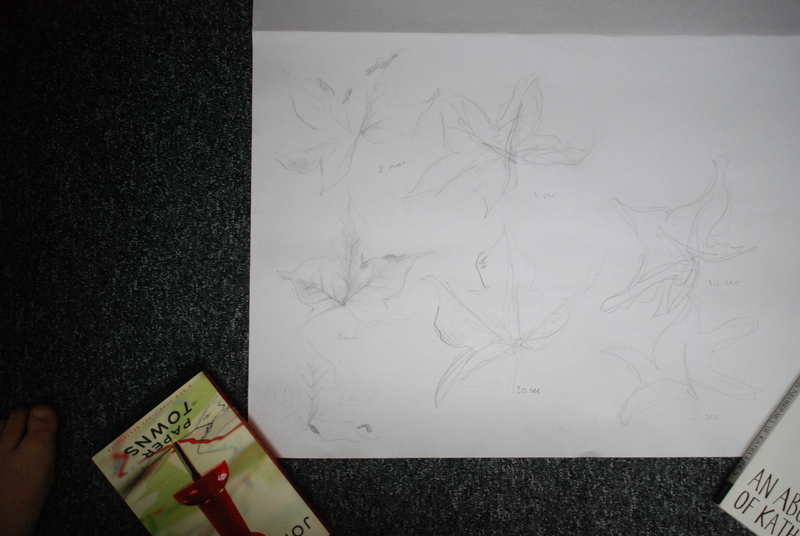 I started with doing various different types of sketches of different types of leaves to find a type of leaf that I thought showed the right manipulability and variation. 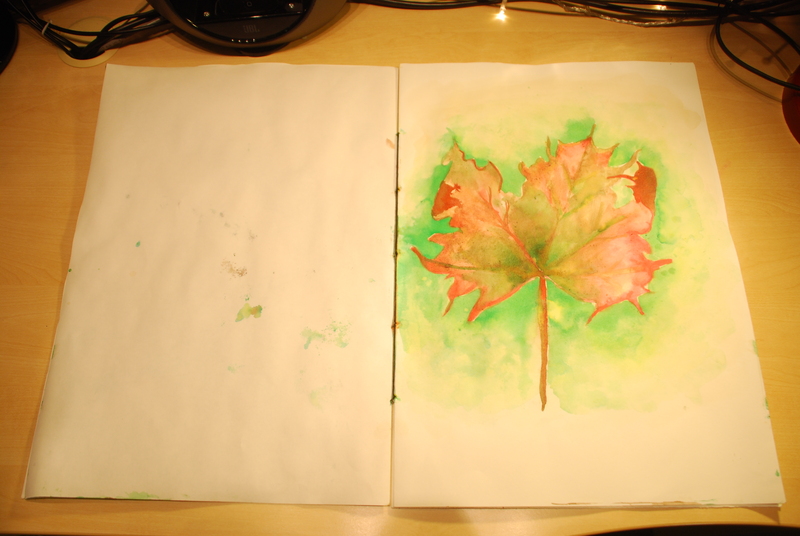 I decided on the large maple leaves, as I thought they were all so different that I would have no shortage of variation, where other types all had quite similar leaves. 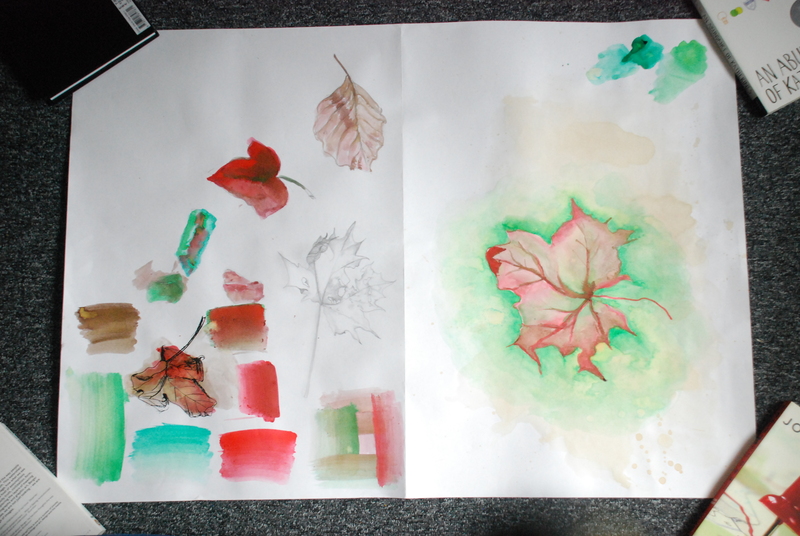 I then went straight into experimenting with colour and medium, and I chose a colour pallet, of which I chose brown/red/greens, with the use of tea to give a dirty finish to the page before drawing, so it didn’t look so glaringly white. 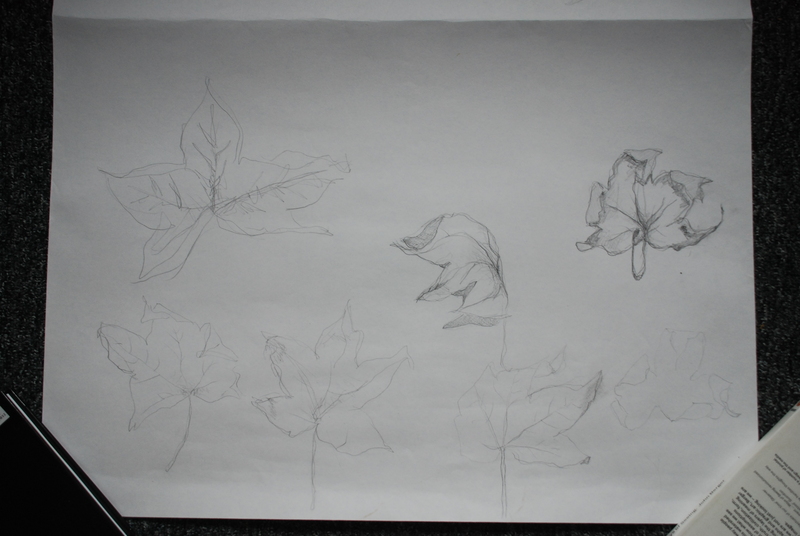 After choosing the colour pallet and style of leave, I went onto the style of drawing I thought was appropriate for what I was trying to represent, I started with very detailed and hard to draw versions of the leaves, but I felt they didn’t show much raw emotion, so I looked at ways of loosening my approach to the project, and so I did some timed left handed drawings, with the leaves posed to try and express emotion. 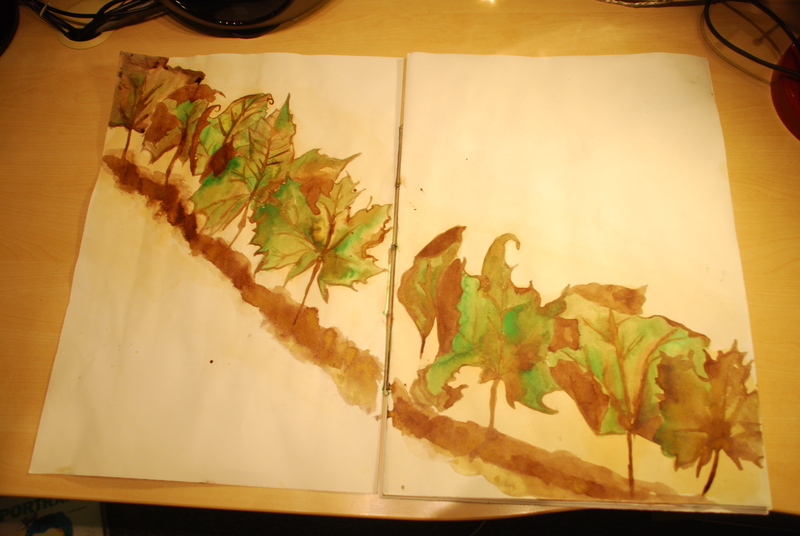 I decided that Indian Ink was the best way of getting the colour I wanted to portray, combined with tea staining. I was extremely happy with the results from my left handed work and I thought this would be the perfect way of showing the frantic actions of the men, when the gas attacked. I also think, it would be a good way of showing the lack of energy and the emotions of the men before as they trudged on asleep, “Bent double, like old beggars under sacks,…”. 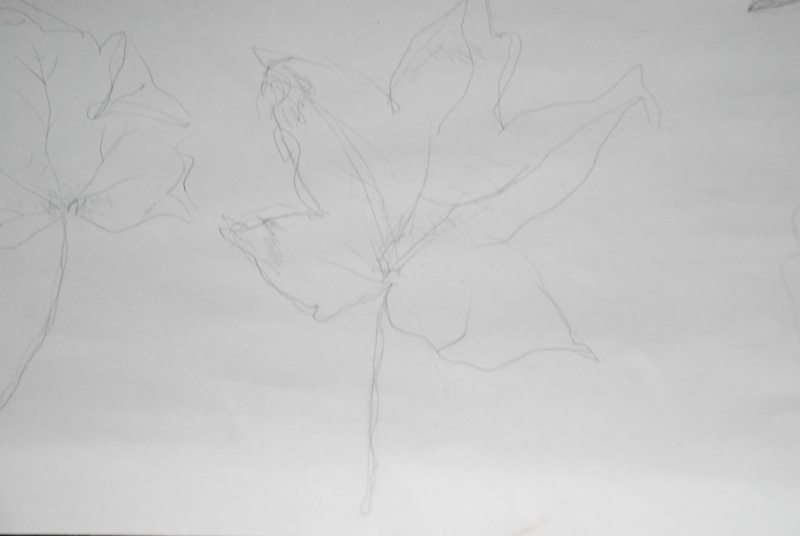 With this in mind, I decided to show the story, starting on an image of a line of bent over tired looking leaves(Or tired to the best of my ability, line a line walking diagonally from the top left to the bottom right of the page with brown sludge below what would be the feet of the soldiers. I then followed this with a more abstract version of what was supposed to be the same scene, but instead of leaves, just a line from the top left to bottom right, where the green fog is beginning to cover the leaves. 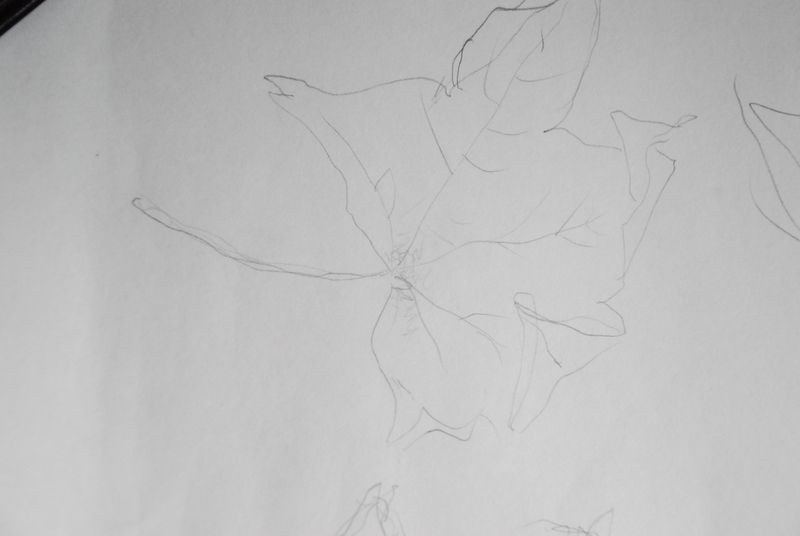 I then followed these drawings, with the beginning of the death of the fallen soldier. 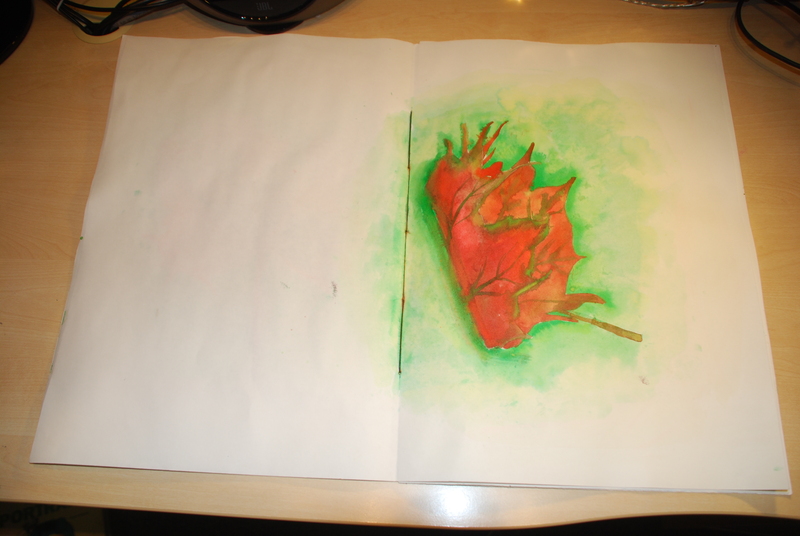 It begins with a not healthy, but just tired looking leaf, and then, as you turn the pages, you see the leaf, falling from the right of the double page, to the centre, where he is withering and dying. I tried to represent this not only in composition but in colour, however this proved hard to do, as Indian Ink is extremely bright, and it proves difficult to dull. 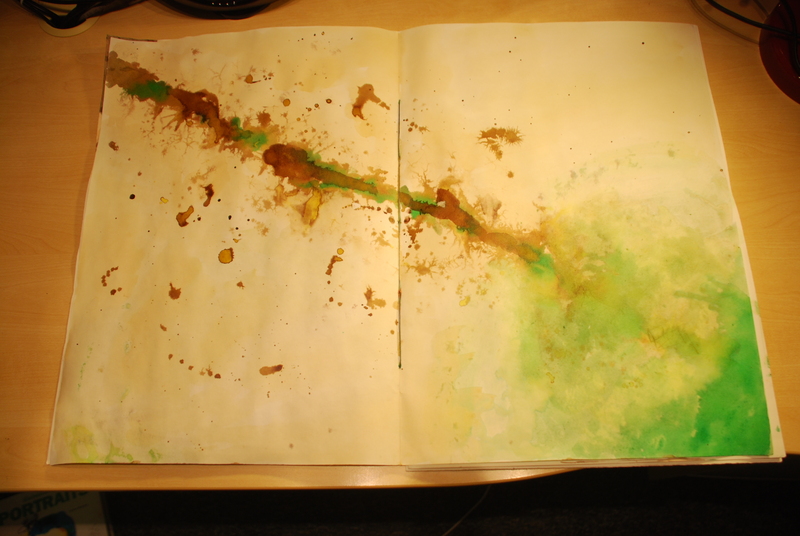 Which if I was to do again, might be a good reason to consider using water colour instead. 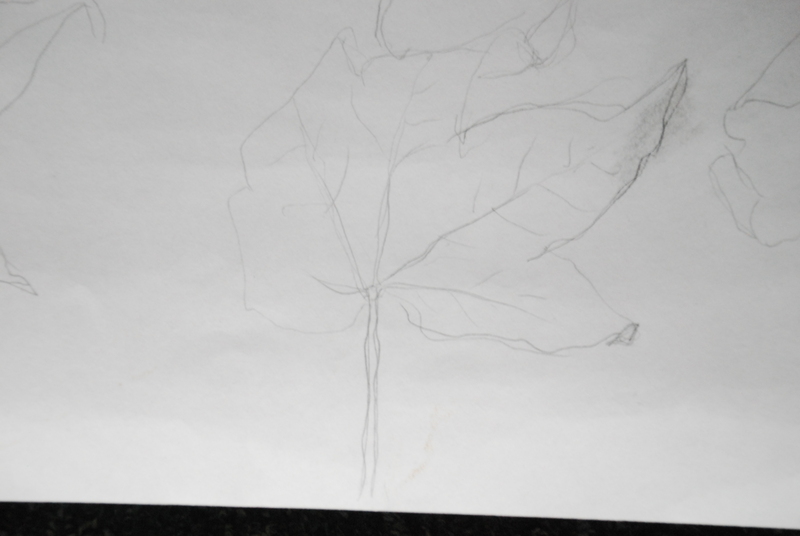 I also did a back and front cover for the poem, for the front cover I drew a leave I view to be a version of the withering away leave in the story, I chose this as I thought it was a good representation of the poems content. I was quite chuffed with the outcome of this project, and I felt I learnt alot about the way an objects composition and how colour can affect the emotion of a scene, as well as the meaning of objects.